The interwebs are buzzing, and the word is quickly spreading like wildfire through Southern California’s haunt community. After 13 years at Knott’s Berry Farm, Jon Cooke has stepped down from his daily position there as a designer, and has been working quietly on a brand-new horror experience in a nondescript industrial building in Upland, California, which will open its doors to the curious public in the weeks ahead. 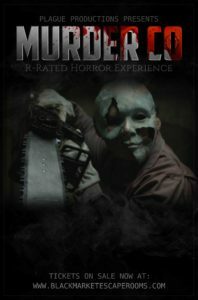 Recently, we paid a visit to Jon’s new venture and stepped into his world – a highly-immersive escape experience/haunted attraction he’s named MurderCo: An R-Rated Horror Experience. MurderCo is an ambitious haunt-escape room hybrid that is going to thrill the hell out of SoCal fans looking for the next big deal. Before we look ahead at what Jon Cooke is about to unleash on the Southland, it’s important to acknowledge his departure from Knott’s, and what it means to events such as Scary Farm; it’s the elephant in the room that everyone is buzzing about, so we would be remiss not to discuss that a bit. The good news is, it’s not a bleak as some are assuming. 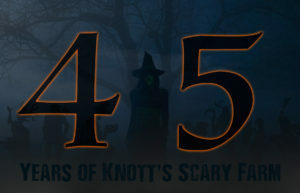 This Halloween season marks a special milestone for our friends at Knott’s Berry Farm. When the fog begins to billow across Ghost Town, and strange creatures begin to emerge from the shadows later this year, it will be time to celebrate the 45th Halloween event the park has hosted – known around the world as Knott’s Scary Farm. Fans need not wait until late September or October to begin celebrating, however. On Sunday, July 30th, Midsummer Scream will proudly present 45 Years of Knott’s Scary Farm, hosted by author/historian Ted Dougherty. 45 Years of Knott’s Scary Farm will close Midsummer Scream 2017 with a special 90-minute presentation on Sunday, July 30th, beginning at 4:30pm in the Terrace Theater, which will accommodate up to 3,000 fans. The unique presentation will feature historical photos of Knott’s Scary Farm, and an unprecedented “rotating panel” that will spotlight individuals key to the creation of, and crucial to the continued success of the haunt that pioneered similar events at theme parks around the world. 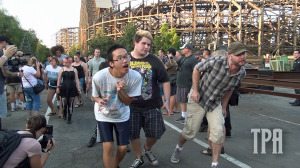 Each year, hundreds of ghouls fill the twisted mazes of Knott’s Scary Farm’s Halloween Haunt event in Buena Park, lurking in the darkness, ready to pounce on unsuspecting victims. They leer, they hiss, they scream, and they lunge; however, many of these creatures of the dark are fresh out of Scare School – a night of training outside and inside of their mazes that will prepare them for the season of screams to come. While a large amount of maze talent does return to work Halloween Haunt each season, there’s always plenty… new blood in the mix. That’s where Scare School comes in – to help returning veterans get mentally and physically limbered up for the task at hand, and to prep and pump up new talent for the experience they’re about to embark on.